Alexander was born into the royal family of Macedonia, the kingdom that would soon rule over Greece. Tutored as a boy by Aristotle, Alexander had an inquisitive mind that would serve him well when he faced formidable obstacles during his military campaigns. Shortly after taking command of the army, he launched an invasion of the Persian empire, and continued his conquests as far south as the deserts of Egypt and as far east as the mountains of present-day Pakistan and the plains of India. Alexander spent nearly all his adult life away from his homeland, and he and his men helped spread the Greek language throughout western Asia, where it would become the lingua franca of the ancient world. Within a short time after Alexander’s death in Baghdad, his empire began to fracture. Best known among his successors are the Ptolemies of Egypt, whose empire lasted until Cleopatra. In his lively and authoritative biography of Alexander, classical scholar and historian Philip Freeman describes Alexander’s astonishing achievements and provides insight into the mercurial character of the great conqueror. Alexander could be petty and magnanimous, cruel and merciful, impulsive and farsighted. Above all, he was ferociously, intensely competitive and could not tolerate losing—which he rarely did. As Freeman explains, without Alexander, the influence of Greece on the ancient world would surely not have been as great as it was, even if his motivation was not to spread Greek culture for beneficial purposes but instead to unify his empire. Only a handful of people have influenced history as Alexander did, which is why he continues to fascinate us. 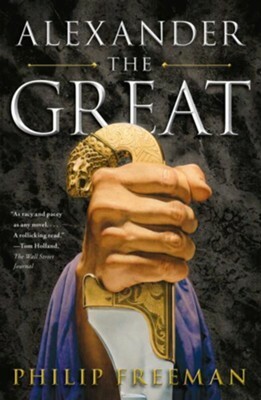 "Freeman tells us about Alexander's life like a novel—a remarkably interesting novel, to boot." I'm the author/artist and I want to review Alexander the Great - eBook.